Our guide shows us several of the Turkish Republic of Northern Cyprus’ many attractions – historic sites, nice beaches and unspoilt scenery, timeless villages and splendid restaurants – but it is a shipwrecked boat that he appears to love the most, referring to it a couple of times as “our baby”. 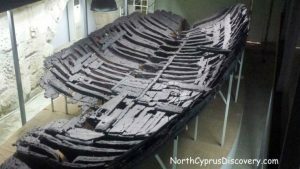 The wreck is a Greek merchant boat estimated to have sunk in a storm around 300BC and it is the oldest vessel ever to be recovered from the seabed, anywhere. It was discovered by a diver in 1965 but he lost the exact position and had to carry out more than 200 dives before he found it again in 1967. After delicate recovery and preservation, it is housed in the Ancient Shipwreck Museum in the Girne Castle. Some 75% of the ship is in good condition and it is displayed with part of its cargo, including two-handled clay amphora jars for carrying oil or wine, and some 9000 almonds. The castle itself was built by the Byzantines in the 7th century next to the harbour on the site of a Roman fort to protect the city from Arab attacks. Over the years, the castle has been renovated, enlarged and utilised by the Lusignans, Venetians, Ottomans and British, making it a complicated mixture of building styles. It is considered one of the most impressive and strongest castles to survive to the present day, and some of the highlights to explore include the Saint George Byzantine Church, dungeons from the Lusignan period, Venetian towers and walls, the Lusignan Tower and Great Hall, Kyrenia Archaeological Museum, Neolithic Settlement of Vrysi Village Museum, Akdeniz Village Tomb and, of course, the “baby”. A gruesome display shows the torture and imprisonment of a 12th-century nobleman. There are waxwork prisoners with beards and loincloths, reproduction torture devices, waxwork torturers with amusing hats, waxwork guards and, in one of the original pits, a particularly miserable waxwork victim of solitary confinement. The picturesque old Girne harbour, chock-a-block with bobbing gülets (traditional Turkish yachts), is one of the best places to visit in the Turkish Republic of Northern Cyprus, bordering a squiggle of narrow lanes lined by flats, cafes, bars and fish restaurants offering lots of good places to taste the local food. If the waxwork torture scenes give you an appetite, then you are only minutes away from a stroll along the waterfront, bordered by tall carob warehouses converted into quayside eateries. Fishing boats unload their catch beneath the Venetian warehouse. Cyprus’s location in the far east of the Mediterranean has made it a key target for neighbouring empires for thousands of years. Whether as trading route, imperial outpost or colonial military base, it was ruled by the Assyrians, Egyptians, Persians, Romans, Byzantines, Arabs, Knights Templars, the French house of Lusignan, Venetians, the Ottomans from 1571 to 1878 and the British between 1878 and 1959. They all had their own uses for Cyprus, some leaving more of a legacy than others. Cyprus is the third-largest island in the Mediterranean, after Sicily and Sardinia. 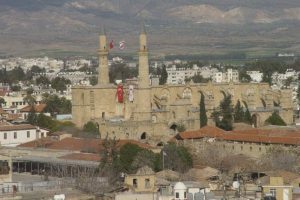 The Turkish Republic of Northern Cyprus comprises some 3355 square kilometres of the island’s 9251 square kilometres. 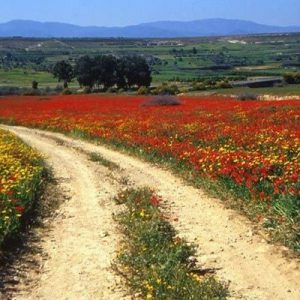 The climate is typically Mediterranean with long dry summers and short rainy winters. There are around 300 days of sunshine a year. The average annual temperature is 19 degrees Celsius. The population is 95% Turkish Cypriot, with Greek Cypriots, British, Maronites, Armeniands, Russians and others making up the rest. The religion is Muslim and the language is Turkish. The currency is the lira (struggling somewhat at the time of writing) and they drive on the left. Due to the political situation on the divided island since 1974, visitors who fly in, such as from Budapest, must land at Ercan International Airport, which is served only by Turkish Airlines and the Turkish budget airline Pegasus, and they can only do so from a handful of destinations in Turkey, usually Istanbul. So visitors from Hungary, say, have to stop over for around an hour in Istanbul Atatürk Havalimani Airport to transfer to an Ercan flight. Airlines can fly direct into the Greek Cypriot side, from where European passport holders, including Hungarians, should be able to cross unhindered by land over the United Nations-controlled Green Line that separates the Turkish Republic of North Cyprus from the southern part of the island. At present there are seven checkpoints, three of them in the capital Lefkosa, as it is known to the Turkish Cypriots, or Nicosia, as the Greek Cypriots call it. Of these three checkpoints, two are for walking through and one is for vehicles. Lefkosa/Nicosia is the world’s only divided capital. Accommodation in the north ranges from five-star luxury hotels to holiday villages and bed-and-breakfast establishments, and tourists will find bird watching, turtle watching, golf, diving, historical site visits, nature visits, trekking and cycling, eco/agro-tourism and traditional village festivals. Cuisine is similar to Mediterranean cuisine with many local and oriental specialities, such as meze (appetisers served on a collection of saucers), hellim (traditional cheese), dolma (stuffed vine leaves), seftali kebab (a type of sausage), bulgur köfte (a filled meatball), börek (a pastry), pirohu (a ravioli), mulihiya (a stew), kolokas (similar to potato) and more. Sweet dishes include katmer (flaky pastry), kadayif (like baklava) and macun (fruits preserved in syrup), plus there is traditional Turkish coffee. 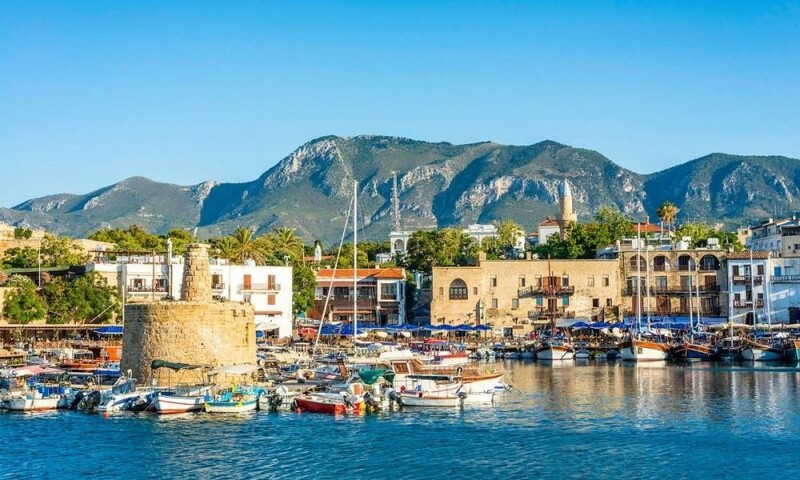 Girne is the most important tourist region and it is one of North Cyprus’ two main ports, along with Gazimagusa, that operate regular ferryboat services to Turkey, which is just 65 kilometres away. 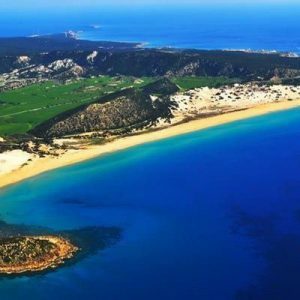 And there is plenty to see in the Turkish Republic of Northern Cyprus. The pride of Lefkosa’s great restored ancient buildings is the Ottoman bulk of the Büyük Han (Great Inn). Set on two floors, the 68-room old caravanserai now displays and sells traditional handicrafts of Cyprus. 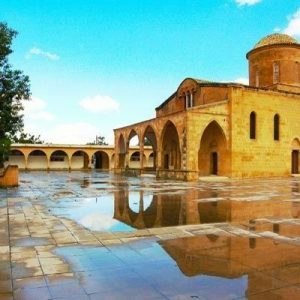 In the heart of Lefkosa where Lusignan kings were crowned is the St Sophia Cathedral, a Gothic pile that was converted to a mosque after the conquest of Cyprus in 1571, becoming known instead as the Selimiye Mosque. The Abrahamet district of the capital is where the Ottoman elites had their mansions, while at Samanbahce the first attempt at social housing in Cyprus was carried out. These 72 buildings make up a unique neighbourhood with very defined geometric narrow roads and units of one-storey mud-brick houses with red tile roofs. At the historical Sarayönü Square is the Venetian Column with the words “The people of this place see themselves not in terms of beauty and wealth but of uncorrupted belief”. At present the square is called Ataturk Square, after Mustafa Kemal Atatürk, the Turkish army officer, revolutionary and founder of the Republic of Turkey, serving as its first President from 1923 until his death in 1938. The capital is surrounded by 15th-century Venetian walls, and the northern side has many fascinating narrow streets, festooned with multi-coloured bougainvillea and heavily scented jasmine. 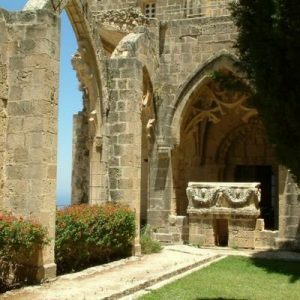 Just a few kilometres from Girne is the hillside hamlet of Bellapais, and the sprawling remains of its abbey, or monastery, founded at the beginning of the 13th century by Augustinian monks after Saladin’s capture of Jerusalem. Its ornate church, Gothic-arched cloister and vast refectory summon a vibrant picture of medieval monastery life. The beautiful and elegant building depicts Gothic styles throughout the stage of its development. A small courtyard is defended by a machiolated gatehouse. Earthquakes brought down part of the building but the idyllic ruins command views over the northern coast and out across the water to the hulking ridge of Anatolia’s Taurus Mountains. More than a few travellers to Bellapais come toting a copy of Lawrence Durrell’s evocative memoir of 1950s Cyprus “Bitter Lemons”. The English novelist stayed here in the mid-1950s and his former house is marked by a yellow plaque. Gazimagusa lies on the island’s east coast and is hemmed in by bulky walls that failed to save the once lavish Byzantine city from the Ottomans in 1571. 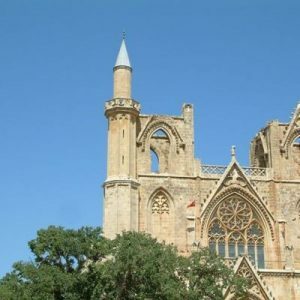 The Lusignan kings of Cyprus were crowned as kings of Jerusalem in Gazimagusa’s soaring example of Gothic architecture, the 14th-century cathedral of St. Nicholas, which is now a mosque. In 1372 the port was seized by Genoa and in 1489 by Venice. The Venetians made it the capital of Cyprus and remodeled the town’s fortifications. Though ravaged by war and earthquakes, and now only partly inhabited, the old walled and bastioned town contains some of the finest examples of medieval military architecture extant. The walls are 15 metres high and 8 metres thick in places, and north of the well-preserved sea gate (rebuilt 1492) stands the citadel known as Othello’s Tower, so called because a lieutenant-governor of Cyprus (1506-08) named Christoforo Moro was allegedly the model for the title character in Shakespeare’s play “Othello”. In the Ottoman period the cathedral was converted into a mosque to symbolise the power of the Muslim faith, and all its Christian features were stripped except some tombstones. 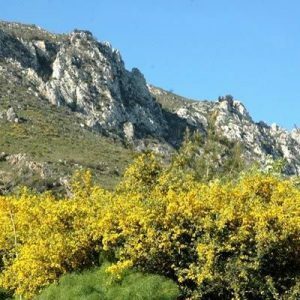 Out in the open countryside of North Cyprus, visitors drive through farmland, passing through carob and citrus orchards and olive groves. 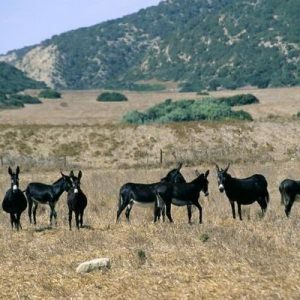 A population of wild donkeys inhabits the panhandle peninsula of Karpas, a peaceful, quiet land that is home to a national park packed with rare flora and fauna, and featuring kilometre after kilometre of lonely beach and sand-dune. 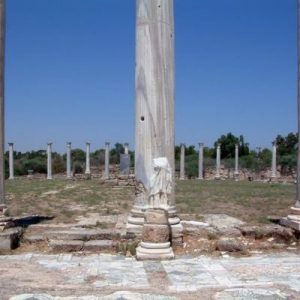 Here is an abundance of history with ancient city sites, Byzantine-period basilicas with intricate mosaics, timeworn churches and traditional Cypriot villages whose inhabitants pursue a way of life now as they have done for the past few hundred years. At the gentle curve of Golden Beach, white-sand dunes meet the calm, clear sea. The tranquility is enchanting, with only some basic restaurants and accommodation options. Each September the beach is a prime turtle-nesting ground. Returning to Lefkosa, a huge red-and-white Turkish Republic of North Cyprus flag can be seen painted on a hillside outside the capital. It is the size of four football pitches, our guide informs us, adding rather gleefully that it is visible from over on the other side of the Green Line too.